It’s a big story in research ethics and it has been reported in major newspapers all over the world. There’s even a Wikipedia page already about this case. The story centres on a fraud case against Diederik Stapel, a well-known psychologist and widely-published researcher at Tilburg University. It is claimed that Dr. Stapel drew inaccurate and false conclusions from analysis of collected data and also that he also falsified and “made up” entire experiments, which were written up and published in a variety of high profile journals, including Science and The Journal of Personality and Social Psychology, a publication of the American Psychological Association. Over his career, Dr. Stapel has published more than 150 papers which each, as the New York Times story about this case notes, are designed to “make a splash in the media” through provocative titles and topics. Not only have his own published papers been found suspect, many of the PhD theses he supervised have been found to be “tainted” according to a Science on-line magazine story. There isn’t a lot to say about this case that differentiates it from others out there about fraudulent conduct in science – there are plenty of stories about research fraud out there (far too many) describing claims of falsification of data, skewing of data, or misrepresentations of data, even “making up entire experiments”. But two things stood out for me the more I read about this case. First, the claims of fraud extend beyond Stapel’s own work and publications. It’s not unusual to read stories about fraud that may imply that colleagues or lab assistants turned a blind eye, or wondered about the veracity of findings or the ‘incredible luck’ of colleagues with seemingly perfect data. But this case extends well beyond inattentive, ignorant or silent colleagues. In this case, Stapel, as a supervisor, included his own students in his fraud and has quite possibly ruined their careers and their prospects. The Tilburg University commission investigating Stapel’s misconduct has recommended that criminal charges may be appropriate based not only on the misuse of research funds, but also on harm done to these students. While many might ask, “Why would he also ruin the careers of students?” it would appear that the fraud was so extensive that he not only had no raw data to provide to students for secondary analyses or to inform their work, but that he really may not have ever conducted a well-run psychological study himself, in order to be able to guide someone else through the process. This “trickle-down” effect of research fraud is typically not addressed at all in stories like this even though it is clear that a key role of a senior scientist is almost always the mentorship of young scientists and researchers. The negative effects of scientific misconduct on those who are junior, who are entering the field with good intentions, thoughtfulness and enthusiasm is a serious potential fallout and one that should be treated just as seriously as the fraud or misconduct. The second part of this story that interested me most was what Carey, writing in the New York Times, had to say. According to him, this case isn’t the straw that “broke the camel’s back”, rather it’s evidence that the camel’s back has already and most certainly been broken. Benedict Carey is a New York Times science and medicine writer since 2004. I’ve read plenty of Carey’s writing and he’s a smart journalist who writes thoughtfully and articulately about all kinds of topics in the science and medical research world. What Carey notes and the Science magazine story confirms is that one reason why Stapel was able to do this so easily is that he never showed anyone his raw data, nor was he ever required to do so. Incredulously, students who wrote their thesis with Stapel as a supervisor were not allowed to view raw data or data sets that were being used for their own papers. Some never even were allowed to conduct an experiment at all. The findings Stapel cited in many of this own studies his colleagues felt were “too good to be true” and their failure to be able to replicate these results were felt to be due to their own shortcomings. “Cutting corners” with data, “statistical sloppiness, falsifying data” and “reporting unexpected findings as predicted” are claims that Carey notes are prevalent in a discipline in which raw data are rarely shared in order to back up results or requested by reviewers to verify findings and conclusions. 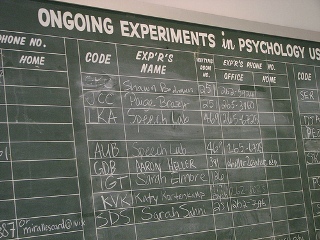 What I’ve found is that researchers in the area of psychology tend to keep datasets for long periods of time — longer than any other human-research discipline I’ve encountered. I find it interesting that no one, at any time, requested to see an anonymized dataset or something to back up the (often) controversial claims of Stapel. In ethics review processes, we often think about what we call “the life of the data”. We are concerned with what happens to datasets after collection and analysis are complete, details about how data are stored, and who might be able to access data in the future. From what I’ve read in research protocols about data management, researchers are not always thinking about the data as the very fundamental proof that can back up any claim they wish to make and publish. I often read graduate student research protocols, from a variety of disciplines, in which they state that the raw data will be destroyed as soon as the research or thesis is published. I always tell them that’s unwise — and that data should be stored for a reasonable amount of time after publication or dissemination of findings. It’s amazing, to me, that this is very often the first time (during the ethics review process) that anyone has talked to many new researchers about the idea that the data are there (and must be there!) as the fundamental link between a hypothesis and the claims made by a researcher. It will be interesting to see if there is any further fall-out from this story. I’ll continue to follow the story and update it. The University of Tilburg established a commission to investigate Stapel’s work and the claims made about fraudulent scientific conduct. As of two weeks ago, it is now available in English here. ~ by Nancy Walton on November 15, 2011. It is interesting that the these frauds have a remarkable parallel in the Man-Made Global Warming industry where results were apparently manipulated to achieve predetermined results for usually self-serving reasons, including the capitulation and subjugation of subordinates.